Left to Right: AFC Chairman, Khemraj Ramjattan; AFC Leader, Raphael Trotman, Executive Member Cathy Hughes and AFC Campaign Manager, David Patterson. Leader of the Alliance For Change (AFC), Raphael Trotman on Wednesday said his party would have to prove its value to A Partnership for National Unity (APNU) by contesting the upcoming Local Government Elections (LGE) alone. “I believe the AFC needs to prove itself to itself. I believe that it should prove itself to its partner; it’s only fair. We shouldn’t demand to the APNU in 2020 that we have a right to be there. We should be able to say this is what we bring,” Trotman told a news conference. He also added that the AFC, which he co-founded in 2005, should prove itself to Guyanese rather than “just allow ourselves a right to be a part of a coalition or in government”. Trotman, who is a former executive member of the People’s National Congress Reform, believed that contesting the November 12, 2018 LGE would allow his party to demonstrate its strength or whether it has lost its sheen, complacent or disconnected from the people. The AFC Leader said vying for seats in the municipalities and some neighbourhood councils would allow his party to form a basis for engaging APNU for the 2020 general elections. “We shouldn’t just say to the APNU that you have no choice but to go with us. We have to bring something to the table and this takes us there and we should demonstrate to the people of Guyana that we have earned the right and their respect and trust to manage their affairs in 2020,” he said. Further, Trotman said with APNU and AFC contesting the local polls separately, Guyanese would be able to get the best from both parties in a quasi-primary elections. “We expect to be in competition against each other but we expect at the same time in battle against the PPP,” he said. Among the issues that APNU and AFC have divided on is the introduction of metered parking through a questionable contract between City Hall and Smart City Solutions. Going into political negotiations in 2015, the AFC had taken with the fact that it had secured seven seats in the 2011 general elections. Those talks culminated with the February 14 ‘Valentine’s Day’ 2015 Cummingsburg political accord between APNU+AFC that, among other things, provided for 40 percent seats in the National Assembly including a number of key ministries. The AFC holds the positions of Prime Minister, Public Security, Public Infrastructure, Natural Resources, Agriculture, Business and Public Telecommunications in addition to several other parliamentary seats, all of which have contributed to the government. 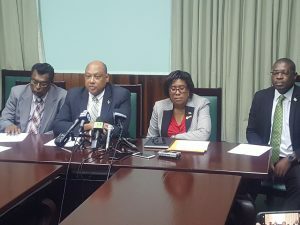 Several AFC party executives, who shared the press conference with Trotman, confirmed that one of the major sticking points was their insistence on a 40 percent share of candidates by using the Cummingsburg Accord model which has worked at the national level. “Naturally, you have 40 percent in the national government and you would naturally want to go into any other election or construct with what you already have with what has worked for you,” he said. Based on the weighty ministerial responsibilities held by AFC members, Trotman indicated that the AFC has earned its right to be in government. AFC Chairman, Khemraj Ramjattan justified his party’s decision to vie the local elections alone, saying it would make it more robust and debunk the naysayers who have concluded that the party is dead. “This but a great opportunity to prove otherwise and that is one of the best reasons in an elections prior to the general elections for going and we know… that we must be in a position to let the people out there know what it is and the relevance and all of that that we still have, as a party,” he said. Against the background of the People’s National Congress (PNC) getting rid of the United Force after the two had coalesced to remove the People’s Progressive Party from power in 1964, the AFC said it was not concerned that the PNC-dominated APNU was setting the stage to kick it out of government. AFC plans to contest elections in every region, but not in all towns and neighbourhoods. The party’s Campaign Manager, David Patterson, saying that the AFC is “an awesome elections machinery” would be fielding candidates from communities.